A family is a place where we find support, kindness, love, magic, guidance, joy or sadness and disappointment. It represents the rope that can take us out of the deepest and the darkest places. Also, the crown that crowns every moment of happiness making it unique, special and long-lasting. We all seek family in our hearts, earlier or later in life. We all want to create ‘’family’’ around us and need somebody to rely on, to share our feelings with and to be comforted by. Being an immigrant means to make the sacrifice to let your family behind sometimes, no matter how painful it is. Some people are apart from their wives or children and count the days until they will be together again. Throughout our journey in NICU, we met so many parents who were alone, without any support, but also, parents who had a bunch of people to welcome their baby, even if it was a very tiny baby. So seeing these people it reminded us how much we missed our families, not only because of the support that could give us but also because they lost the moment of a life coming to the world, a moment that reminds us about GOD`s power and blessing. However, a family is not about being together and happy all the time, but also to transcend difficult situations. Moreover, is when we are apart we realise what we mean to each other and enjoy, even more, when together. Aurora and Victoria spent over 230 days in the hospital, and each hospital had its own rules regarding the visiting time, strict rules were applied for siblings to prevent any viruses spread. 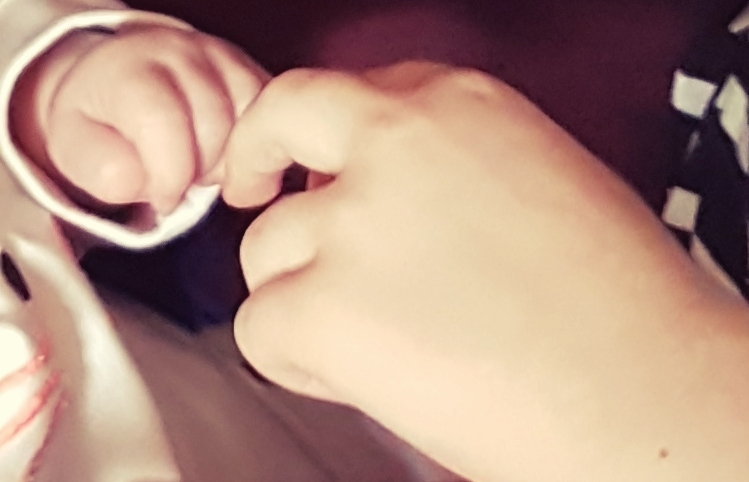 At UCLH, in NICU, a level 3 UNIT, the winter policy was adopted on 3rd October 2017, so after that time Maria was not able to see her little sisters until spring would come. At Whittington Hospital, level 2 unit, it was adopted on 12th November, but the girls came in on 14th. It was very challenging to manage to be everywhere, and we almost forgot the feeling of being together, because one of us had to look after Maria, and the other one, to be at the hospital. There were days when Maria did not see her daddy as he used to wake up early in the morning to go to work and visit the girls after work. Rarely, we had time to talk face to face. In the middle of the winter, I got a cold, and I was not able to visit Aurora and Victoria, so my husband had to spend more time at the hospital. Instead, I spend more time with Maria. On a Sunday, I told her that we will go to pick up her dad and will spend the rest of the day together, and she said: ‘’But I do not have a daddy anymore. Daddy stays only at the hospital’’. It was heartbreaking for me to see how much she needed both of us to be with her. When the doctors asked about Maria, we told them what she felt, so they allowed her to come for an hour to visit her sisters when there were not too many babies at the unit and she did not show any sign of a cold. It was 4th of February 2018, a chilly afternoon when Maria and I came to the hospital. When we got there she asked me: ”Are you sure I can go in?”. She was so curious to see how much Aurora and Victoria have grown, and I was so excited. For an hour we could look at each other, talk and laugh without having to think what are Aurora and Victoria doing, without feeling guilty for being in a place, but not at the other…After a long time, we felt a complete family again. Throughout that hour we recharged our batteries, filled the empty spots in our hearts and collected memories where we could go back any time we wanted to be together again until the spring came, and Maria was allowed to visit again. Sometimes, the quantity is not as important as the quality. Little things made with love, dedication and loyalty, are precious and unforgettable. Maria, Aurora and their dad. Maria, Victoria (left), Aurora (right) and their dad. All of us…as a family that we are.